The Trombidiformes are a large, diverse order of mites. In 1998, Trombidiformes was divided into the Sphaerolichida and the Prostigmata. The group has few synapomorphies by which it can be defined, unlike the other major group of acariform mites, Sarcoptiformes. 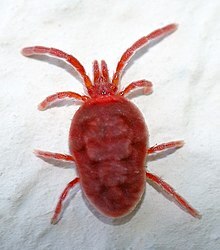 Its members include medically important mites (such as Demodex, the chiggers, and scrub-itch mites) and many agriculturally important species, including the spider mites (Tetranychidae) and gall mites (Eriophyidae). The 2004 classification retained the two suborders, comprising around 125 families and more than 22,000 described species. Prostigmata Kramer, 1877: Still the biggest branch in this taxon, with four infraorders and 40 superfamilies. ^ a b c Heather Proctor (August 9, 1998). "Trombidiformes. Trombidiform mites". Tree of Life Web Project. Retrieved June 9, 2010. ^ David Evans Walker (2004). "Hidden in Plain Sight: Mites in the Canopy". In Margaret Lowman, H. Bruce Rinker (ed.). Forest Canopies. Physiological Ecology Series (2nd ed.). Academic Press. pp. 224–241. ISBN 978-0-12-457553-0. ^ a b Zhang, Zhi-Qiang; Fan, Qing-Hai; Pesic, Vladimir; Smit, Harry; Bochkov, Andre V.; Khaustov, A. A.; Baker, Anne; Wohltmann, Andreas; Wen, Tinghuan; Amrine, James W.; Beron, P.; Lin, Jianzhen; Gabrys, Grzegorz; Husband, Robert (2011). "Order Trombidiformes Reuter, 1909" (PDF). In Zhang, Z.-Q. (ed.). Animal biodiversity: An outline of higher-level classification and survey of taxonomic richness. Zootaxa. Magnolia Press. pp. 129–147. ISBN 978-1-86977-850-7. ISSN 1175-5334. This page was last edited on 23 March 2019, at 23:38 (UTC).